An Attitude of Gratitude Never Hurt Anyone! 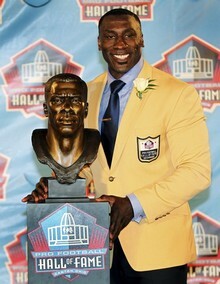 This past weekend was the NFL’s Hall of Fame induction ceremonies. This year’s class included Richard Dent, Marshall Faulk, Deion Sanders and Shannon Sharpe. I love the Hall of Fame weekend because it’s a reminder that the NFL season is just around the corner. I can’t wait to see how my beloved Packers handle the difficult task of repeating as Super Bowl Champions! For the past several years I have found myself DVRing the induction speeches. I read somewhere that the HOF guidelines require each inductee to limit their speech to 8 minutes! You have to be kidding me. Fortunately most of the inductees disregard that guideline and most speeches go between 15 and 20 minutes in length. The speeches are filled with emotional stories of determination and gratitude. The inductees thank everyone from the nominating committee, their parents, grandparents, siblings, coaches, trainers, owners, agents, teammates, fans, wives and children…not necessarily in that order. View the best of this year’s HOF speeches here: Hall of Fame Induction Speeches Highlights. As I was watching the speeches on Saturday it got me thinking. Why does it take an occasion like being inducted to the Pro Football Hall of Fame to thank everyone that helped you become the person you are today? It happens all the time in our own lives. How many times have you heard someone say…”my only regret is I never told her how I felt before she passed away.” You don’t have to have that happen! Go out and thank somebody today that means something to you. Thank your parents for raising you. Thank your spouse for putting up with you. Thank your boss for hiring you. Thank your customers for placing their trust in you. You don’t have to be a Hall of Famer to thank someone-but done in the proper way-might just make you feel like one!